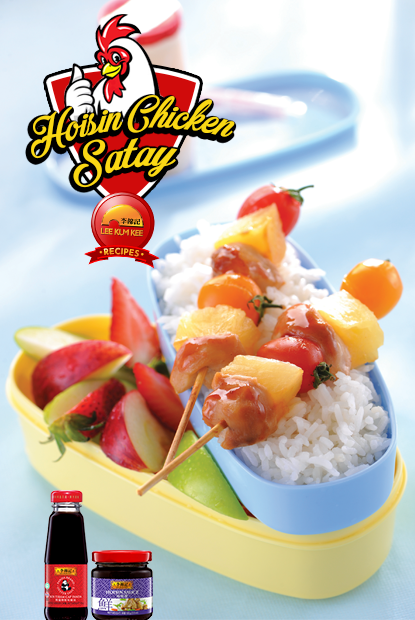 Here’s a great baon idea for your family! Soak the skewers a day before to prevent them from burning. 1. Marinate diced chicken in Panda Brand Oyster Sauce, set aside. 2. Skewer in sequence: Chicken, pineapple and cherry tomato. Brush a little oil on the satay stick. 3. Mix Lee Kum Kee Hoisin Sauce, Panda Brand Oyster Sauce and vegetable oil together to baste on the satay. 4. Grill satay for 2 minutes on each side, basting consistently with the sauce mixture. 5. Before putting it inside the baon, baste it again with sauce.